Where Will Mortgage Rates Land? Thirty-year, fixed-rate mortgages in 2018 have been rising at the fastest pace in 50 years and reached 4.66 percent for the week ended May 24 before dropping to 4.56 percent this week. However, mortgage rates did not increase proportionally to the federal funds rate determined by the Federal Reserve because they are determined by longer-term economic factors beyond solely the influence of central banks and monetary policy. Some Fed officials and economists believe that long-term structural factors — such as changes in demographics, a slowdown in productivity growth, and heightened demand for safe assets — will continue to keep the 10-year U.S. Treasuries, a proxy for U.S. fixed-rate mortgage rates, low going forward. 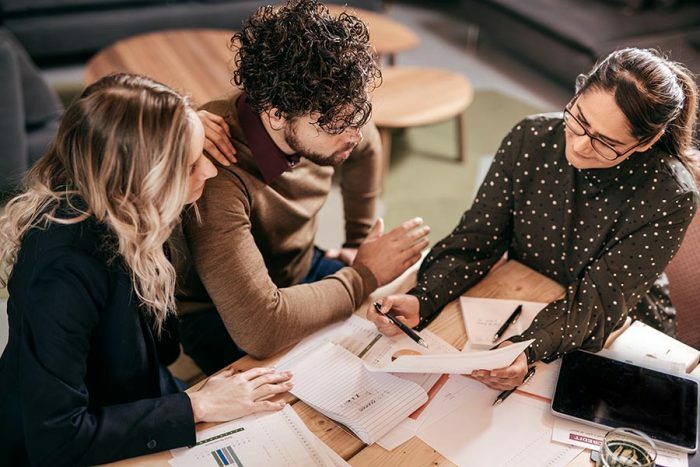 According to the Federal Reserve of San Francisco, the new normal for the natural rate of interest is around 2.5 percent, 2 percentage points below the long-term average, which puts mortgages rates at about 5 percent or slightly higher over time. Shorter term, through the end of 2018, 30-year fixed rate mortgages are still expected to reach no more than 4.7 percent. The Federal Open Market Committee has signaled that it would increase the federal funds rate at its June meetings. Markets have most likely already priced in the hike. Some Fed officials urge caution in how fast it continues raising rates because of inflation expectations, the neutral policy rate, the flattening yield curve, room to grow business investment, and labor markets. There are concerns that if the rate hikes are too aggressive, they could tip the U.S. economy into recession. California housing markets have continued to see robust demand in 2018, driven by favorable demographics and economic growth. Strong demand coupled with dwindling inventory are the main reasons that home prices have maintained double-digit percent annual increases. Nevertheless, continued increases in mortgage rates are a concern for housing demand going forward, as affordability constraints price more households out of the market. According to Freddie Mac data, mortgage rates in 2018 have been rising at the fastest pace in nearly 50 years, reaching 4.66 percent for the week ended May 24, then falling to 4.56 percent by May 31. This is the highest mortgage rates have been since April 2011 and about 70 basis points above the 3.95 percent rate seen one year ago. During the same period, median home prices in California have also risen by roughly 10 percent, though many areas of the state have seen much higher appreciation. The combination of rising mortgage rates and higher home prices means that a buyer who purchases a median-priced home today will spend about 20 percent more on their monthly payment compared with a buyer who purchased the same home last year. Still, even with the recent hikes, historical perspective suggests that mortgage rates are still very favorable. Figure 1 illustrates 30-year, fixed-rate mortgage trends going back to 1971 and emphasizes the continual five-decade decline in mortgage rates. The smaller figure zooms in data to the most recent decade and also illustrates the federal funds rate set by the Fed, which impacts short-term interest rates and indirectly mortgage rates. 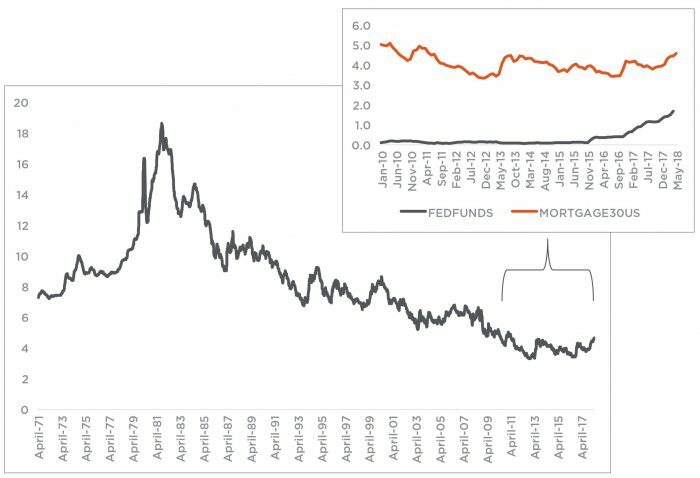 Of note is that since the Fed started increasing federal funds rates at the end of 2016, neither short-term rates nor mortgage rates have followed the same pattern and rose at a slower pace. However, with the recent rapid rise in mortgage rates and the Fed’s plan to move forward with three to four more hikes this year, the burning question is where rates will end up. Economists and other experts have varying views on the issue. Similarly, there is no agreement among Fed officials on how frequently it should continue to hike rates. Generally, Fed officials expect to be at a 2.125 percent federal-funds rate by the end of the year, up from 1.75 percent currently. Also, further increases are expected for 2019, pushing the rate to 2.9 percent and to 3.4 percent by the end of 2020. Some Fed members, most recently James Bullard of St. Louis Federal Reserve, are concerned that aggressive hikes may be detrimental to the current economy and that caution should be used when deciding whether to raise the policy rate in the near term. The reasons for caution include inflation expectations, the neutral policy rate, the flattening yield curve, and room to grow business investment and labor markets. And while each reason deserves extensive discussion, the following paragraph offers a summary. First, market-based inflation expectations for the next five years are below the Fed’s 2 percent target, thus its continued focus on 2 percent may limit its credibility. Second, the current federal funds rate puts neither upward or downward pressure on inflation, thus increasing the rate will not push inflation higher. Third, the yield curve — which is the difference between interest paid on longer-term Treasuries versus short-term Treasuries — is getting smaller; that is the difference between the grey line and orange line in the smaller chart. It suggests that increases in the federal funds rate have not been followed by corresponding increases in longer-term Treasuries, or mortgage interest rates for that matter. Longer-term rates and mortgage rates are determined by longer-term economic factors beyond solely the influence of central banks and monetary policy. This is what economists call the natural rate of interest — the real interest rate expected to occur when the economy is at full strength. And some Fed members and other experts believe that the new normal for a neutral interest rate will remain low. But before explaining the reasons behind the new normal, let’s address the last two reasons for caution against rapid policy-rate increases. Fourth, business investment spending in the last decade has been very low, and while corporate tax reform is meant to spur investment, Bullard does not believe that faster economic growth would cause more inflation at this point. Lastly, Bullard thinks that labor markets are generally in equilibrium, meaning that workers are on the same footing as employers, which again puts no pressure on inflation. And if labor shortages begin putting stronger pressure on wages and causing inflation, firms can substitute labor with capital, thus keeping a lid on inflation. So what is driving the new, lower normal for a natural rate of interest? Some experts believe that long-term structural factors, such as changes in demographics, a slowdown in productivity growth, and heightened demand for safe assets, have led to a global natural rate decline despite the doings of central banks. In terms of demographics, life expectancy is longer and keeps extending, which leads people to save more for retirement. This increase in savings keeps a lid on interest rates. Furthermore, research by San Francisco Federal Reserve reveals that these drivers will not reverse, even after the baby-boomer shift. Slowing productivity growth is one question heavily debated among economists, and there is no definite agreement. Nevertheless, productivity has slowed, and retiring baby boomers and lower fertility rates are partially to blame, since both cause fewer people to enter the labor force and fewer people to produce and consume goods, which results in slower growth and less investment. Again, it is not a factor expected to change unless society experiences another technological revolution comparable to the Internet. In terms of increased demand for safe assets, technology in part, but also international wealth creation, has driven a global demand for safe assets. Other than real estate and cash, U.S. Treasury bills are some of the assets investors consider safe, hence keeping the lid on interest rates. And every time there is uncertainty, political unrest, or economic concerns abroad, investors flock to U.S. Treasuries — and there has been plenty of uncertainty in recent years. As a result of these drivers, John Williams of San Francisco Federal Reserve believes that even as the Fed raises rates, these fundamental drivers will keep the short-term rate at about 2.5 percent, which is 2 percentage points below the long-term average. Currently short-term, one-year Treasury rates oscillate around 2.28 percent. By contrast, those who believe that the natural interest rate will move up to the long-run average refer to robust economic performance, such as strong financial conditions, solid global growth, and the fiscal stimulus. However, according to Williams’ analysis, fiscal stimulus is only expected to increase the natural rate by no more than 0.25 percentage points over the next decade and retreat afterward. This limited effect is in part because the tax cuts have a larger effect on growth in the next few years than in later ones. Taken together, it is with little certainty that economists can predict the future of mortgage rates. At June’s Federal Open Market Committee, the Fed is likely to increase the federal funds rate again, as it has sent strong signals to market participants. The recent jump in mortgage rates may already reflect the June increase, and mortgage rates may not change much if the Fed raises rates later in June. Current forecast expectations still put the 30-year fixed rate mortgage rate at no more than 4.7 percent, through the end of 2018. Beyond that, if the natural rate is to settle at around 2.5 percent, the traditional, 30-year, fixed-rate mortgage could hover around 5 percent or slightly higher over the longer term.